2. 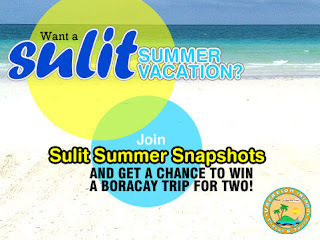 Submit a photo with an "I ♥ Sulit.com.ph" text to promos@sulit.com.ph. 3. Promote your entry to your friends and make them "like" it. The entry with the most number of likes will get to win trip for 2 to Boracay (including airfare, accommodation, and pocket money). Promo ends May 5, 2010.